Jewish Practice Mitzvahs & Traditions The Synagogue What's In a Synagogue? 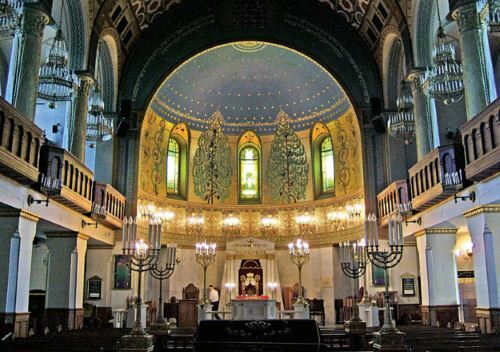 A synagogue is a place of Jewish worship. In addition to housing a sanctuary for services, synagogues often serve as the centerpoint of Jewish life. The word “synagogue” is the Greek parallel to the Hebrew term beit knesset, “house of gathering.” Synagogues can be found virtually wherever there are Jews and have been in use since the Babylonian exile. 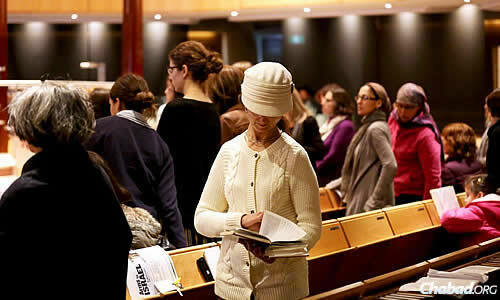 Find a synagogue service near you. What Does a Synagogue Look Like? Who’s Who in the Synagogue? When Do People Attend Synagogue? The exact dimensions of a synagogue vary, reflecting the culture, needs, means and tastes of those who built it and use it. However, you can generally expect it to have chairs (or pews) arranged in such a way that the worshipers are facing toward Jerusalem, once the site of the Holy Temple, and the place through which all prayers ascend to G‑d. 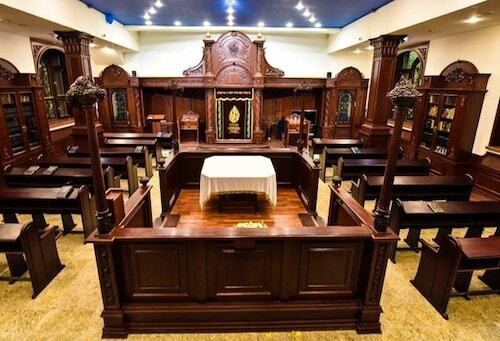 Learn an in-depth article on the laws of building a synagogue. 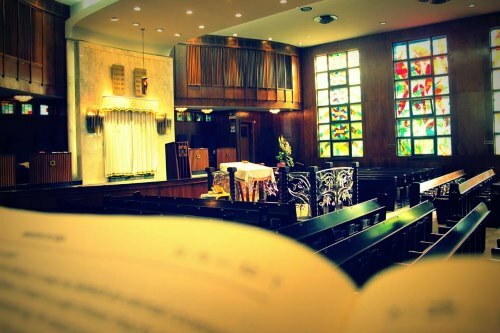 In the front of the sanctuary is a cabinet called the aron kodesh (“holy ark”), which contains the Torah scrolls, the most sacred objects in Judaism. Handwritten in Hebrew letters on parchment, each scroll contains the Five Books of Moses. The scrolls are stored in the ark and are removed only to be read during services or on other special occasions. The exact size and look of arks vary greatly, however, most of them have doors as well as an ornate curtain (parochet), which are opened at key points during the prayer. Learn more about the ark. In many synagogues there is an eternal light (ner tamid), situated above the ark. The flame (or light bulb) is a symbol of the “western lamp,” which continually shone in the Holy Temple in Jerusalem. Learn more about the ner tamid. The bimah, used for the reading of the Torah. Traditionally placed in the center of the sanctuary and facing toward the front of the room is the bimah (“platform”), the table from which the Torah is read. It is often (but by no means always) covered by a cloth and placed on a raised stage. 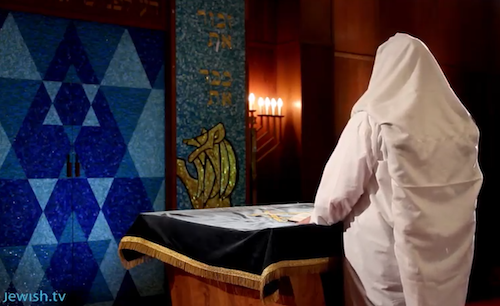 Learn more about the bimah. The prayers are led from the front of the room. There is generally a lectern, called an amud (lit. “pillar”) on which the leader (who also faces the front) can place his prayerbook. The curtain of the ark, as well as the cloth coverings of the bimah and amud can be any color. However, during the High Holidays white coverings are generally used, reflecting sanctity, purity and forgiveness, all themes of the season. Learn more about the amud. In Jewish tradition, men and women sit separately during prayers. In many (older) synagogues, seating for women is in a gallery above the sanctuary. It is more common, however, for men and women to both be seated on the same level with a mechitzah (“partition”) between them. Read: What’s Wrong With Mixed Services? Jews during hearfelt prayers, joined in a minyan, a quorom of 10 Jewish men. The Rabbi: A synagogue rabbi is the spiritual guide of the congregation. In many communities, the rabbi also delivers a sermon on Shabbat and holiday mornings and on other special occasions. Read: What is a Rabbi? The Rebbetzin: In many congregations, the wife of the rabbi takes on a quasi-official leadership role, guiding, teaching and leading. The Chazzan(Cantor): Most prayers are led by a member of the congregation. It is considered an honor to lead the congregation in prayer. In many congregations there is a specially designated cantor who leads the prayers on Shabbat and holidays. The Gabbai: Often translated as “warden,” the gabbai (or gabba’im plural) helps keep things organized and running smoothly. During the Torah reading, the gabba’im call up people to the bimah for the readings (aliyahs) and distribute other honors. You: That’s right. Every single Jew is important, and we all contribute to the whole. Whether you can read Hebrew or not, you are an integral part of the congregation. Jewish prayer takes place three times a day: morning, afternoon and evening. The afternoon and evening services are often held back to back. On Shabbat the services are somewhat longer, and often better attended. Read: The Three Daily Prayers. 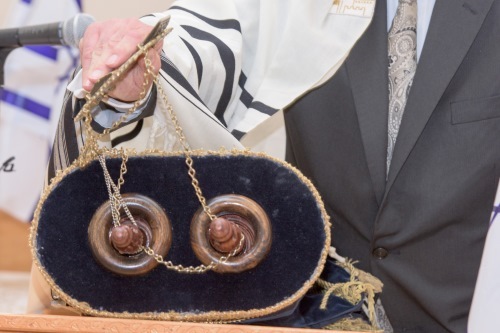 A circumcision, also known as a brit (or bris), is often held in a synagogue. Read: What to Expect a Brit Milah. A bar mitzvah, celebrating a Jewish male’s 13th birthday. Read: What to Expect at a Bar Mitzvah. An aufruf, celebrating the Shabbat before a wedding. Read: What to Expect at an Aufruf. 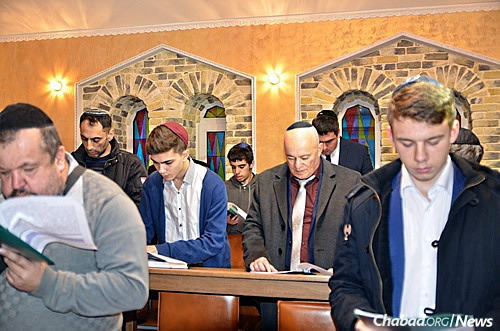 Following the passing of a loved one, mourners attend synagogue to recite Kaddish for the first 11 months, and then subsequent year on the anniversary of passing. Learn about Kaddish here. Shabbat morning. Read: What to expect at Shabbat Morning Synagogue Services. Rosh Hashanah services, marking the start of the High Holidays. Read: What to Expect at Rosh Hashanah Services. Simchat Torah. Read: What to Expect at Simchat Torah Services. All of above is just the basic intro the synagogue, but remember that the best way to get to know the synagogue is to visit the synagogue. The natives are friendly, and so are the rabbis, so just feel free to drop in and make yourself at home!